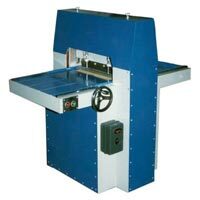 Cloth Sample Cutting Machine that we manufacture, export and supply is known for its solid construction and compact design. It is suitable for cutting small numbers of samples. Owing to its easy functionality, compact design, and longer service life, our machine is widely in demand. 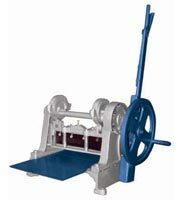 We offer Cloth Sample Cutting Machine in both manual and motorized types. Buyers can obtain our Cloth Sample Cutting Machine at inexpensive rates. Solid Construction & Compact table mounting model. Suitable for cutting small numbers of samples. Models available in different blade size of 13" & 18". Technocraft, the specialist for innovative Sample cutting technology. Our wealth of experience is demonstrated by more than 1000 installations India & Abroad. The comprehensive product program provides the right solutions for your needs as well. A hand lever operated device with stopper is provided to get to and fro motion of sliding table with calibration which guarantees the equal, accurate & high production of samples Ideal for cutting maximum fabric heap of 50mm and maximum strokes per minute. The main body of-machine will be single piece, made from special graded casting, so as to get smooth & virbration free operation. Models available in different blade size having 13", 18", 24", and 36"
Effortless Zigzag cutting of suiting, shirting, blended woolen, denim, furnishing, knitted & tyre cord fabrics.